"Euphoria! The S&P 500 had its best quarter in 10 years" sounds so much more positive than "the S&P 500 has almost regained what it lost since last September". Lower-risk funds with high-risk-adjusted funds that are trending higher are downloaded from Mutual Fund Observer. The funds are ranked for top Lipper Categories. Three model portfolios are created that are diversified and suitable for the risk averse investor, those investing according to the business cycle, and the buy-and-hold investor. 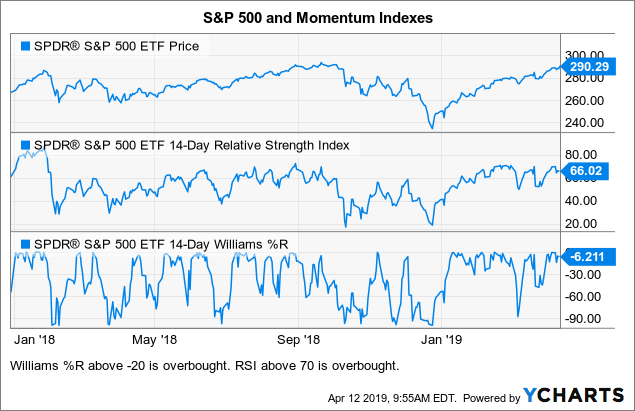 While the S&P 500 has returned over 9% for the past 15 months, the Williams %R and Relative Strength Index momentum indicators suggest that it may be overbought as shown in Chart #1. The economy continues to slow. Chart #2 shows that the GDP Nowcast is currently 2.3% while the Federal Open Market Committee is projecting growth below 2% over the next two years. The Federal Reserve maintains its dovish position. 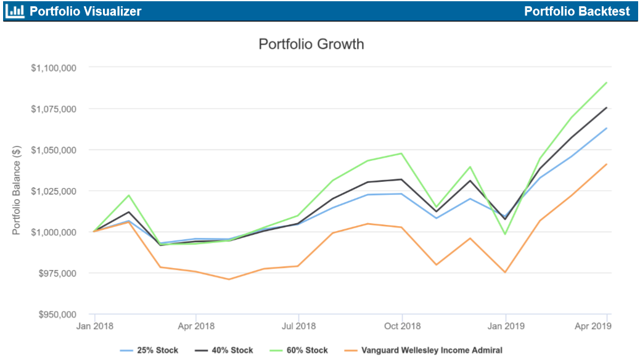 Each month, I sort through over a thousand funds from the Mutual Fund Observer looking for low-risk (Ulcer Index), higher-risk-adjusted returns (Martin Ratio) that are trending higher, and pay dividends to add to my personal portfolio. I only consider funds that are no load, have expense ratios of less than 1.25%, minimum investments of $25,000, and are open to new investors. 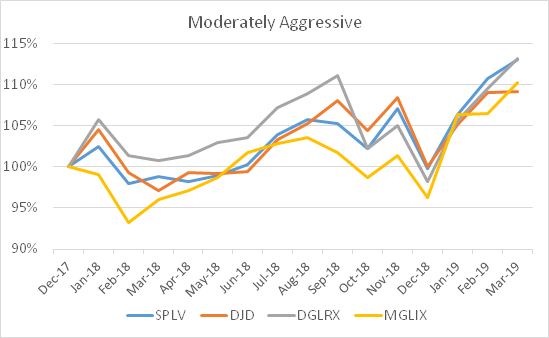 Three- and ten-month trends, price to earnings ratio, maximum drawdowns and bear market deviation, and risk (Ulcer Index) are used to exclude outlier funds. One qualifying fund from each Lipper Category is selected from Vanguard, Fidelity, Exchanged Traded Funds, and other top-ranked mutual funds. The Lipper Categories are then ranked by risk (Ulcer Index), risk-adjusted return (Martin Ratio), 3-month trend, 10-month trend and dividend yield. Three model portfolios are created that are diversified and suitable for the risk averse investor, those investing according to the business cycle, and the buy-and-hold investor. The funds are validated in Morningstar. The finalist funds are loaded into Portfolio Visualizer and three portfolios are created based on maximum Sharpe ratio, and maximum return at 5% and 8% volatility. These model portfolios are then adjusted to 25%, 40% and 60% stock. Below are the results of the three model portfolios for the past 15 months since the markets became more volatile. They are compared to the Vanguard Wellesley Income Fund (VWIAX), which is a great fund suitable for many conservative investors. The results have $3,350 withdrawn each month to reflect a 4% withdrawal rate. Funds are broken out by exchange traded funds, Vanguard, Fidelity, and other funds to meet the preferences of readers. Some categories do not have corresponding funds because outliers (P/E, 3- and 10-month trends, and risk) are eliminated. The table below is from Mutual Fund Observer data and contains the funds loaded into Portfolio Visualizer to be considered for inclusion in the model portfolios. Risk is from safest (1) to very aggressive (5). Ulcer Index is an estimation of risk based on depth and duration of draw down. 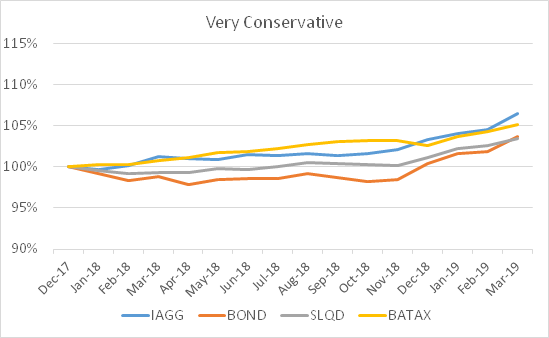 The Martin Ratio is the risk-adjusted return, calculated as fund return above Treasury bills divided by the Ulcer Index. This [3 Year Tax Cost Ratio] represents the percentage-point reduction in an annualized return that results from income taxes. The calculation assumes investors pay the maximum federal rate on capital gains and ordinary income. For example, if a fund made short-term capital-gains and income distributions that averaged 10% of its NAV over the past three years, an investor in the 35% tax bracket would have a tax cost ratio of 3.5 percentage points. The Invesco S&P 500® Low Volatility ETF (SPLV) is 24% invested in utilities, so I did not include the Invesco S&P 500® Equal Weight Utilts ETF (RYU) in any of the model portfolios to avoid over concentration. The fund performance is graphed below by risk rating. For an investor seeking to reduce risk from the equity market, multi-sector income funds may be an option. The AdvisorShares Newfleet Multi-Sector Income ETF (MINC) may be more suitable for those that are more risk averse while PIMCO Income A (PONAX) may be suitable for someone willing to take on more risk. PONAX did not make it through the screens because it has a load fee, but it is only charged at some investment companies. 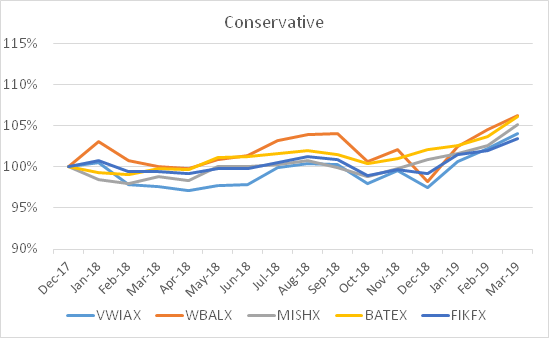 Comparing the AdvisorShares Newfleet Multi-Sector Income ETF to PIMCO Income A, both have had low drawdowns over the past five years, with MINC being only a half of a percent, while PONAX has had substantially higher returns. PONAX has outperformed its peers while MINC underperformed. Mutual Fund Observer classifies MINC as Very Conservative and PONAX as Conservative. Another consideration is that PONAX has a three-year tax cost ratio twice as high as MINC and may be more appropriate for a tax advantaged account. The Fund seeks to achieve its investment objectives by investing under normal circumstances at least 65% of its total assets in a multi-sector portfolio of Fixed Income Instruments of varying maturities, which may be represented by forwards or derivatives such as options, futures contracts or swap agreements. "Fixed Income Instruments" include bonds, debt securities and other similar instruments issued by various U.S. and non-U.S. public- or private-sector entities. The Fund will seek to maintain a high and consistent level of dividend income by investing in a broad array of fixed income sectors and utilizing income efficient implementation strategies. I believe that the risk of recession is low for 2019, but that volatility will remain high. My own portfolio lies somewhere between the model portfolios with 25% to 40% stock consisting of lower-risk funds and higher-risk-adjusted returns. As a result of writing this article, I increased my holdings in PONAX. Disclosure: I am/we are long VWINX, SPLV, FIKFX, VTABX, VFSTX, FSDIX, PONAX. I wrote this article myself, and it expresses my own opinions. I am not receiving compensation for it (other than from Seeking Alpha). I have no business relationship with any company whose stock is mentioned in this article. Additional disclosure: I am an engineer with an MBA nearing retirement and not an economist nor an investment professional. The information provided is for educational purposes and should not be considered as advice. Investors should do their due diligence research and/or use an investment professional.